We all know that the weeks surrounding back to school are hectic. There are new schedules to learn, morning routines to get back into, and somewhere in the mix of all of that, lunches need to be packed for school or work. Now, I’m pretty sure most of you would agree with me that a PB&J can get tiresome after awhile. If you want a little variety in your lunch menu, or if you’d like to add a tasty tidbit to your next party menu, these Chicken Pinwheels that I whipped up today will hit the spot. They are super easy to make, just a little bit spicy, and absolutely delicious. Mornings in my house are INSANE. Really, when you think about it, they shouldn’t be. We’re fortunate. We have enough bathrooms for each member of our household, but for some reason three of us seem to take turns with the master bath, which means we’re all taking turns. So, by the time everyone finally gets downstairs in the morning, we’re hustling to get everything in order. Luckily, when I’m thinking ahead, I might whip up some pinwheels at night so lunch is easier to throw together in the morning. I like Chicken Pinwheels as a lunch choice because I know I’m giving my kids a nutritious lunch entree. All that’s left is tossing in a couple small sides like berries or nuts, and my kids will get just enough food to eat. They love pinwheels for a few reasons: they are fun, they are colorful, and they taste SO good. Since my kids don’t bring their lunch everyday, it is helpful to have things on hand for the days they decide they want to bring their lunch. 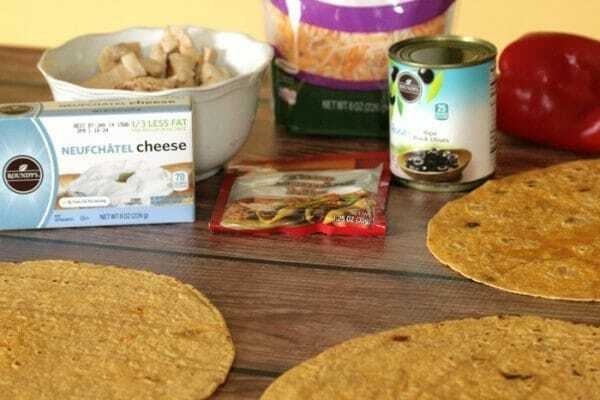 I try to have a combination of fresh ingredients: produce, nuts, tortillas, dairy products like cream cheese and shredded cheese; as well as a mixture of canned goods. When it is time to make lunch, all I have to do is pull a few ingredients out of the pantry and refrigerator and create something special for them. This recipe can be made by just about anyone. It really does not take any special skill. You’ll need 4 tortillas. 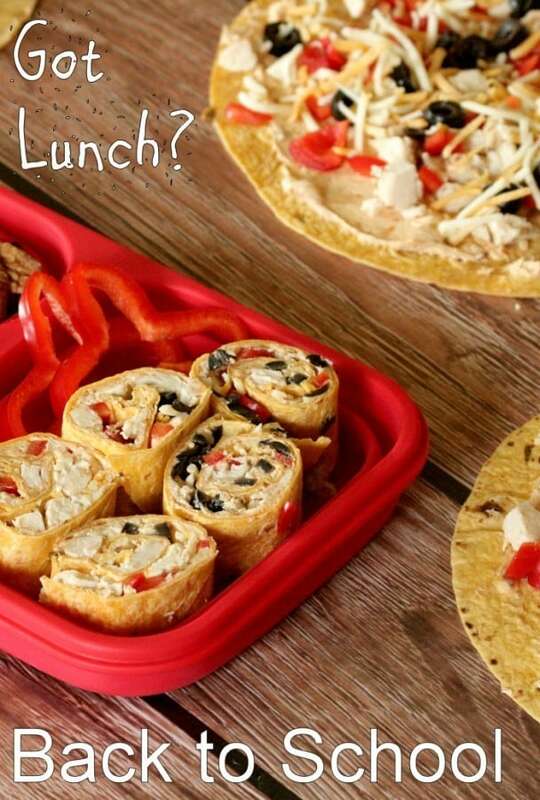 I used jalapeno and cheese tortillas to add some pizzazz to my pinwheels, but any type of tortilla would work. Start by laying the tortillas out on your work surface. Mix together 8 ounces of cream cheese (or substitute- I often use Nuefchatel cheese, which is lower in fat) with 1/2 a package of taco seasoning. Stir it together until the seasoning is well incorporated. Then, divide the cream cheese mixture between the 4 tortillas and spread out with the back of a spoon. Next, add toppings. 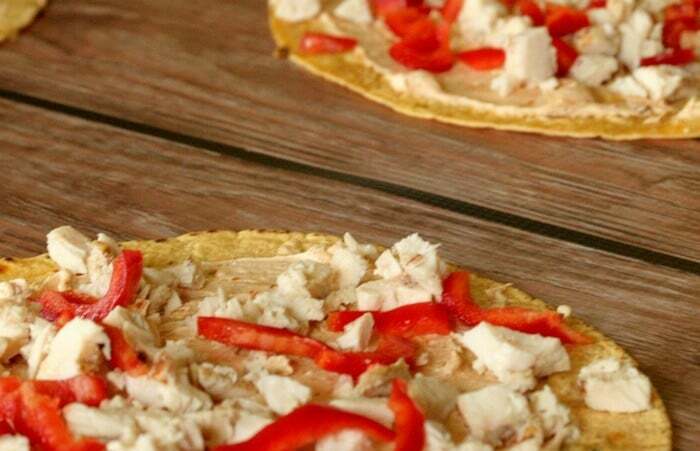 Chop up 9 ounces of grilled chicken and 1 red pepper. Add a spoonful or two of sliced black olives to each tortilla, and about 1/4 cup of Mexican cheese. 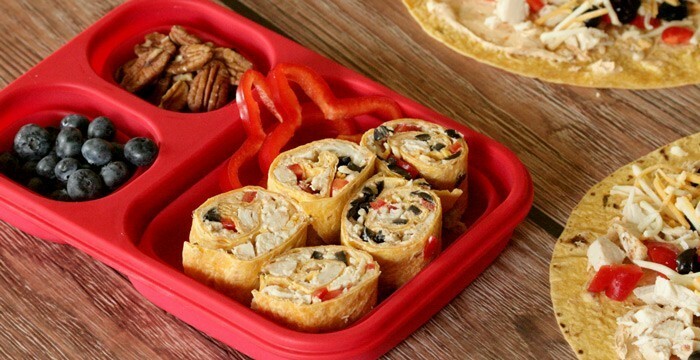 Delightfully simple, deliciously presented… your child will love this twist on a pinwheel in their lunch! Add in some berries and nuts like we did, and you have a balanced lunch perfect for pack and go. I’ve discovered that getting the kids out the door in time doesn’t have to be hectic. I just have to get organized. Lunches like this make it a bit easier. Mix together cream cheese and taco seasoning. 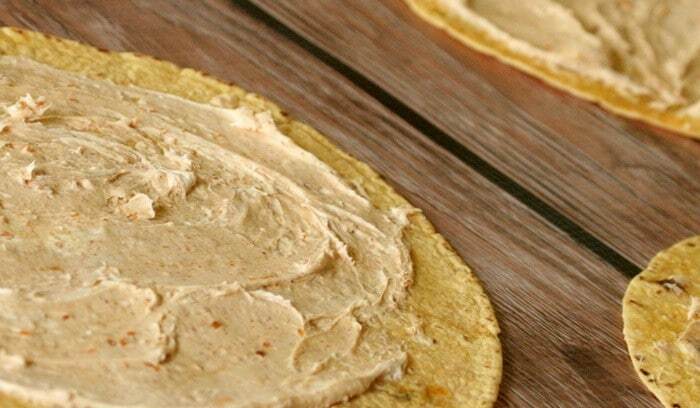 Spread over tortillas. 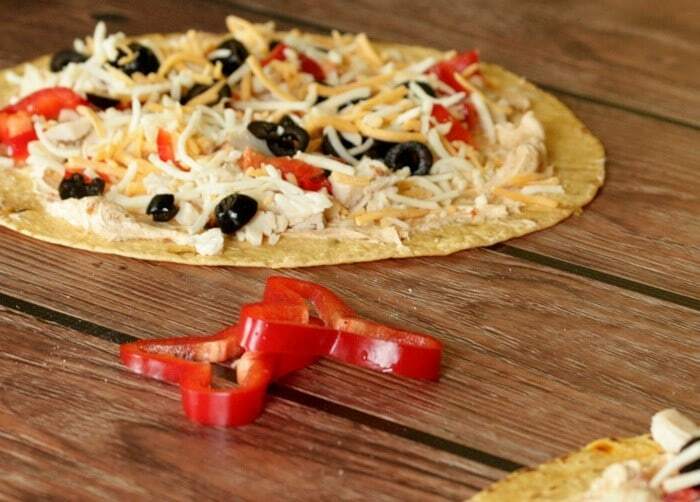 Divide chopped grilled chicken, cheese, red pepper and olives between the 4 tortillas. Roll up, refrigerator for a few hours or over night if time allows. Cut ends off and then slice up into 5-8 pieces per tortilla. I love wraps, this looks great. Thanks for linking up to Sweet and Savoury Sunday, stop by and link up again. Have a great day!! I love pinwheels, and these look so good! Thanks for sharing at the Creative K Kid’s Tasty Tuesdays Party. I have pinned it to our Tasty Tuesdays Pinterest Board.